No longer does he make the recipe in large drums in his back yard. Gone too are the empty whiskey bottles and gallon jugs he would fill with the dark blend to give to friends. And he no longer markets it at the local surf shops. Now he deals with the largest food distributors on the West Coast. 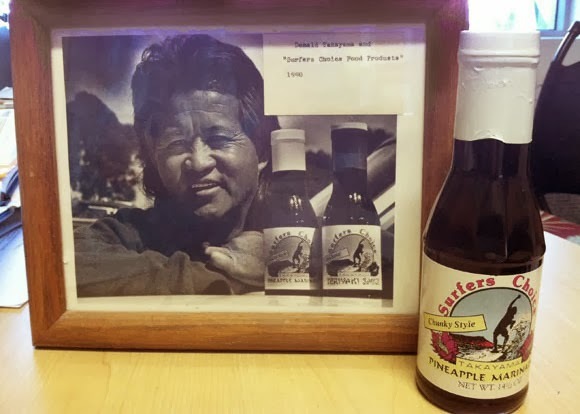 His product line includes the teriyaki sauce (called "Da Kine"), and a sweet and chunky pineapple marinade. He gets letters almost every day from people describing how they use Surfer's Choice. "Some people dunk doughnuts in it, others put it on their hash browns and eggs. One of my friends can't eat cottage cheese without it, and one guy wrote me saying he even drinks the stuff," Takayama said. Most people use it with fish, poultry and meat dishes either as a sauce or marinade. Unfortunately, like Donald, the marinades are now relegated to our fond memories. Come celebrate his memory on Nov. 16, his birthday, from 4-7pm at the SHACC. $5 admission, FREE for members of SHACC.